- Having a DevOps team. Q: What is your underwear size? Though I have been associated with the Large Scale scrum (LeSS) community for about five years (though the “community” did not exist, I can think of my association with like minded folks) this is my first LeSS conference. While I used to attend a lot of conferences in the past, I have started focusing more on deep learning (by attending focused workshops) than focusing on conferences. But this year, I had to make an exception for the LeSS conference. Why? (a) It was the first LeSS conference in North America, (b) It was not very far, and (c) I was thinking that I might meet some of the smartest people in the LeSS community whom I may not meet otherwise, and (d) I have heard that it is a “team based” conference (unlike other conferences where you are on your own), and I wanted to find out what the heck it was. I was not disappointed. The venue itself was very different from the conventional Agile conferences – not a hotel. That definitely caught my attention!! I was pleasantly suprirsed to see both Howard Sublet (the new Chief Product Owner from Scrum Alliance) and Eric Engelmann (the Chairman of the Board of Director of Scrum Alliance ). Howard and I had good discussions on LeSS, Scrum Alliance, the marketplace, and scaling. LeSS Games – component team and feature team simulation lead by Pierluigi Pugliese – very interesting simulation – I used a variation of this in my CSM class past weekend and people liked it. I hope to write about sometime, in the coming days. Two days was short!! Time flew away. It was a great experience!! And I wish we could have a North American LeSS conference every year!! I’ve attended the 2018 LeSS Conference – my first – in the Angela Orensanz Center in New York. I was really inspired by the many great speakers, experiments and experiences and was glad I could help Jurgen de Smet by his workshop on Management 3.0 practices that can complement LeSS with experiments. As I use many games and practices in organizations or courses, I’ve seen several great new games that I can use myself. 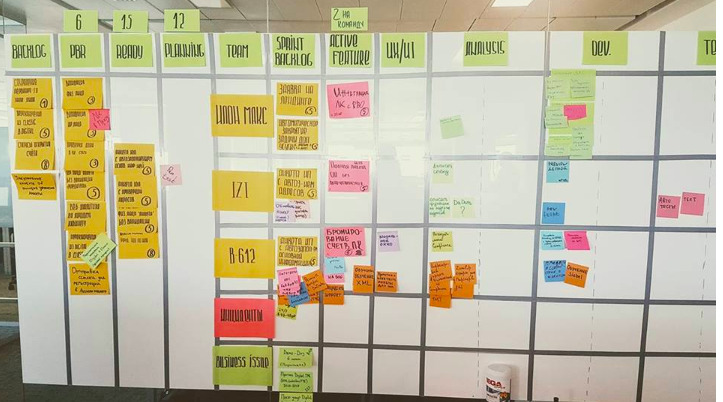 The ‘building agile structures’ game of Tomasz Wykowski and Justyna Wykowska was the most outstanding game for me, because it makes the differences between component and feature teams very clear when scaling work, and I will use this for sure in the future. The experiences at Nokia by Tero Peltola were very inspiring and especially the focus on the competences (of everybody) and technical excellence I will take with me. Thoughts that will stick with me the most after the conference: the focus on technical excellence (including e.g. automation, code quality, engineering practices etc.) and the importance of the structure of the organization, following Larman’s fifth law ‘Culture follows structure’. The latter I’m already familiar with, but needs to be reprioritized in my mind again. The former will be my main learning goal the coming period and I will need to dust off my former experiences. Manager’s view on failures and breakthroughs.Tero Peltola Bas Vodde did the impossible to summarize it in an hour, Thank you! There are no short cuts, always balance out long vs short terms, start with what’s possible. Alexey Krivitsky took us through one of the most critical exercises to success. Emerson Mills thx for sharing with me your experience. Thank you both! Define product to be delivered, not preassigned roles/people; personal choice of the team is best motivator. True coaching, secrets for making it sustainable->decentralize(! ), along with anti-patterns very practical “how to”. Thank you Ari Tikka Gene Gendel! Nothing speaks louder than benefits of transformation being presented by the Firm itself.Bravo Konstantin Ribel! 🎯Enlightening talk how much we truly control our own decision making process. Thank you Mr Craig Larman! Experience impact of different structures in a fun way, while building common understanding across the board Thank you Justyna Wykowska and Tomasz Wykowski! Learnt from the expert approach to sequencing games, its underlying purpose and best ways to leverage it, which comes only with years hands on experience. Greg Hutchings Thank you! 3 huge transformations. Merrill Lynch, UBS. Gordon Weir huge shout out! It’s close to impossible, but it’s doable. My favourite🗝Team=Product, if you get that, you get it all. Last, but not the least, beers, laughs and thought provoking conversations! Looking forward to hashtag#LeSS2019! 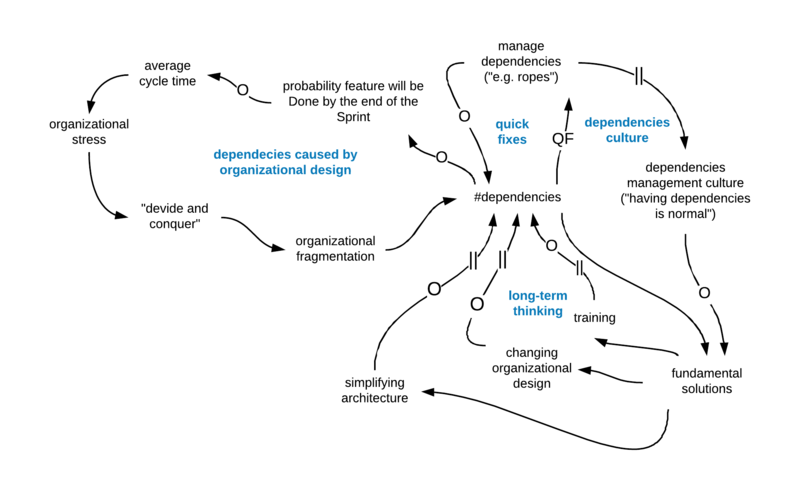 If you worked in large organizations you have probably heard about the term “dependencies”. 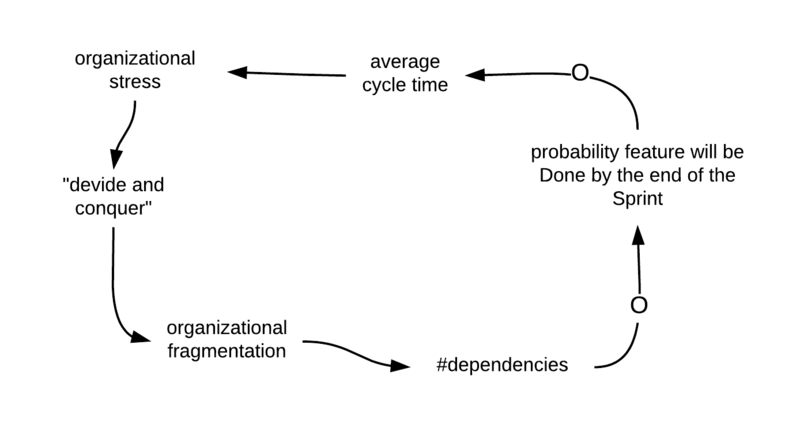 I am convinced that dependencies need to be eliminated, not managed. 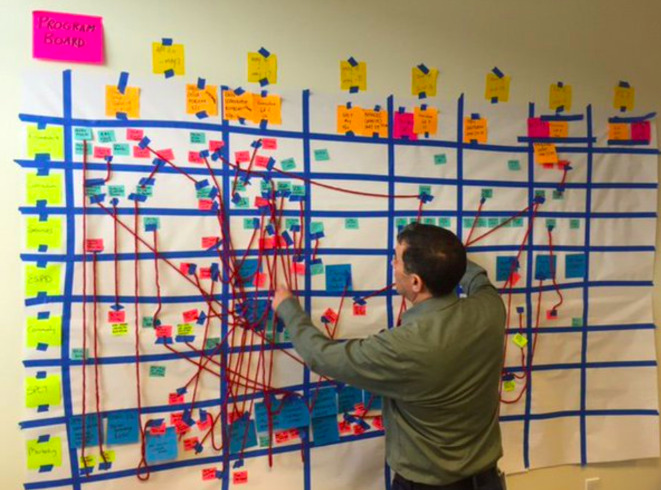 With a help of system diagrams in this article, I will uncover the main reasons why Scrum Teams suffer from dependencies, how they impact organizational agility, and what the fundamental solutions to this issue are. A typical management response to organizational stress is “divide and conquer”. For instance, if there is a problem with the quality, let’s create a separate department “quality control” with set of its own KPIs. Creating new functions, units, component teams and coordination roles, managers strengthen the fragmentation of the organization. More fragmentation leads to even more dependencies. Imperfect organizational design based on component teams ( “bus team”, “analytics team”, “Android Team”, “integration team”). It causes intensive fragmentation. Unreasonably complicated architectural design ( “there are 256 systems in our organization)”, which inhibits creation of cross-component and cross-functional Scrum Teams. Feature Teams do not need the strings because there are no dependencies or they are trivial. Fundamental solutions are simplification of the architecture, Feature Teams and training people.